How to make yogurt. Step-by-step directions. Fermented milk products have been used since man started herding cattle, goats, and sheep more than ten thousand years ago. Some bacteria will turn milk into a stinking, disgusting liquid that nobody would like to eat, but there are many types of bacteria that produce dairy products that are very tasty and nutritious. 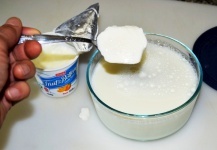 Sour cream, buttermilk, kefir, and yogurt are fermented milk products that are very palatable and popular. Yogurt contains live probiotic bacteria that are beneficial for the digestive system because they promote regularity and inhibit the growth of pathogenic bacteria in the colon. Some of the typical bacteria in yogurt include L. bulgaricus, S. thermophilus, L. acidophilus and L. casei. If this is your first time making yogurt, buy a small container of yogurt with active cultures that you can use as a starter. 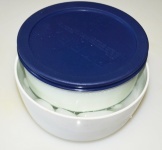 The preparation of yogurt requires sterilization of the milk and the containers to prevent undesirable organisms from contaminating the culture. Pour boiling water on the container and the lid that is going to be used to ferment the yogurt. Let the hot water stand for five minutes, empty the container, cover it loosely and set it aside to cool. 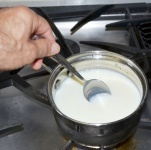 Pour the milk into a pan, and heat in a double boiler or place the pan on the stove over low heat stirring constantly until the milk reaches a temperature of 185°F (85°C) or starts to foam. Heating the milk kills any unwanted bacteria that may be present and denatures the milk proteins making them more suitable for bacterial reproduction. Turn off the heat and pour the milk into the container. Put the spoon in a sterile place or in the container with the yogurt culture. Do not rest the spoon on non-sterile surfaces that will contaminate the culture later. 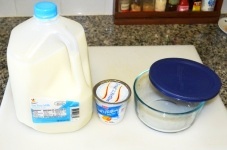 Let the milk cool until the milk reaches a temperature of 110ºF (43ºC) and the container is warm to the touch. This is important because putting the yogurt starter in hot milk will kill the bacteria that are needed to ferment the milk. 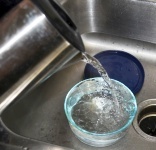 The cooling process may be speeded up by putting the container on a dish with cold water. 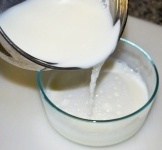 Add the yogurt starter to the warm milk and stir it until it dissolves completely. Keep the yogurt warm, at a temperature of about 100°F (38°C), for about 7 or 8 hours. At this point, the milk should have turned into a soft solid which is the finished yogurt. Refrigerate it, and enjoy it with fruit or cereal. You can also use the yogurt for Greek Mediterranean salad dressing or for mint sauce for lamb kabobs. Save some yogurt to make your next batch.